A Little Bag, the perfect size for basic stuff - wallet, phone, sunglasses, keys - for the day. 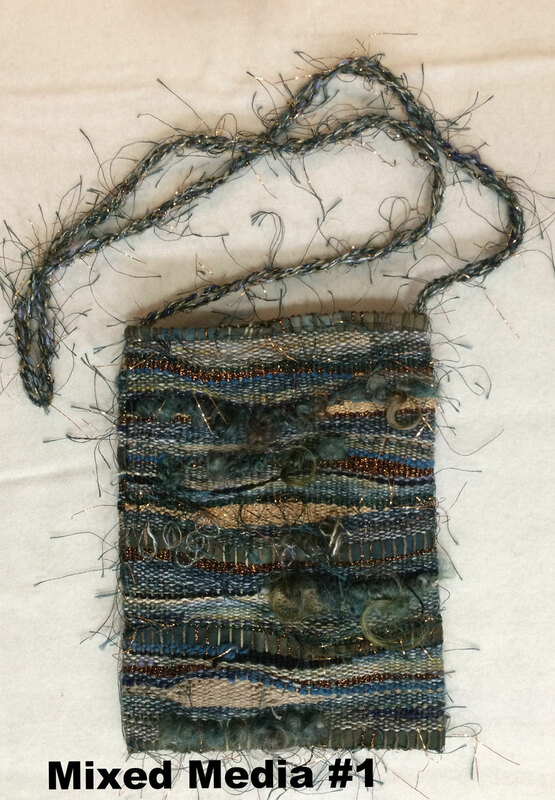 Measures 6.5" x 9", lined with hand-dyed cotton inside and magnetic snap closure. Strap is 40" for use over the shoulder. Hand-dyed cotton fabric, hand-dyed wool locks, linen, cotton yarn, polyester and nylon novelty yarns make up this mixed media fun. Hand-woven on my little rigid heddle loom. Thank you. Hand-woven Little Bag the perfect size for basic stuff - wallet, phone, sunglasses, keys - for the day. 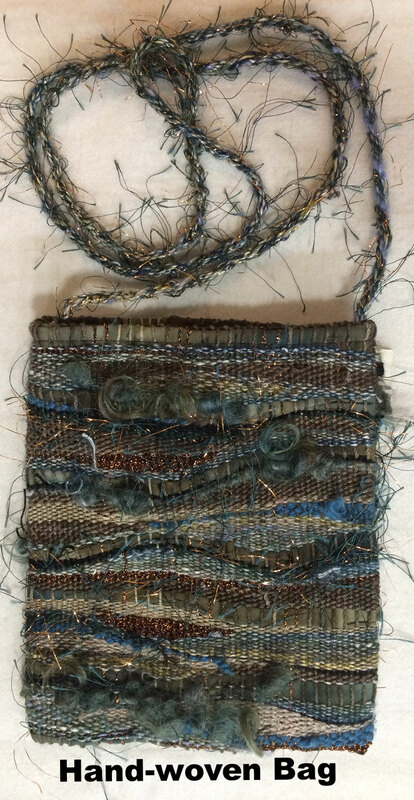 Measures 7" x 8", lined inside with hand-dyed cotton and magnetic snap closure. Strap is 45" for use over the shoulder. Hand-dyed cotton fabric, hand-dyed wool locks, linen, cotton yarn, polyester and nylon novelty yarns make up this mixed media fun. Fresh from the wood shop! Hand-pieced wood bowl with decorative lid to control the yarn while you are knitting or rug hooking, or even warping your loom. Several varieties of wood are used, showing their natural color. The top is approximately 6 inches in diameter. Another wonderful tool from my dad's woodshop. The lucet tool is an ancient Viking tool used for making cording. A sample is shown using my handspun yarn.